Info "Blast away the evil bots!" Robotomy is Wario-Man's microgame in WarioWare: Twisted! 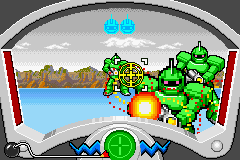 The player must tilt the Game Boy Advance and shoot three robots. Green robots are stationary, blue robots move from side to side, and red robots move towards the player. If the red robot gets too close to the player, they will lose the game. Level 1 - Three green robots need to be shot. Level 2 - One green robot and two blue robots need to be shot. Level 3 - One green robot, one blue robot, and one red robot all need to be shot. This page was last edited on November 17, 2018, at 03:15.